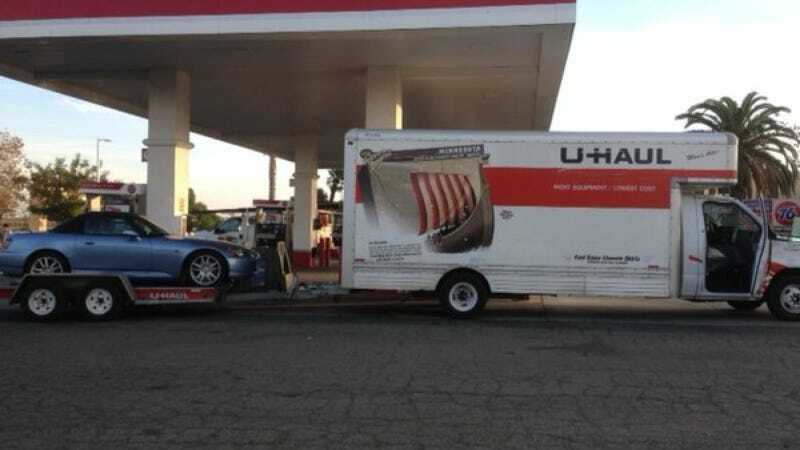 Navy veteran Stephen Boland and his daughter Rachel are in the middle of a move from Sacramento to Atlanta with all their belongings in a U-Haul truck towing Boland's Honda S2000 behind it. But a stop in San Antonio, Texas means they'll have to start over when they get to Georgia. TV station KENS5 reports that the family's trailer, which contained their possessions, was stolen Sunday while the two ate dinner on the San Antonio Riverwalk. The two say they left the truck in a protected lot with a security guard who claims to have seen nothing. Police found the truck on the West Side the following morning, but it was completely empty. The thieves have not been caught, and Boland's belongings — which included furniture and clothes — have not been recovered. Luckily, Boland's S2000 was not taken, and the two say that all of their items are replaceable except for family photos and jewelry. But this does mean that they have to start completely over when they reach Atlanta, where Boland is taking a new job with the U.S. Department of Veterans Affairs. I don't even think I can put into words just how angry this makes me. You've got a car enthusiast and a veteran, who works to help other veterans, and his young daughter who have to start from scratch on top of a cross-country move thanks to some thieving assholes in San Antonio. I hope those people get what's coming to them, whoever they are. If you're interested in helping Boland or have any information about the stolen truck, please contact police or check out their Facebook page. Update: Here's their gofundme page if you want to help out.